Tag: EN 361:2000 | Hütter Safety International B.V. The 1 point high comfort harness is developed for the frequent user of fall arrest products. The 1 point harness is a two colored harness with 5 adjustment points and 1 dorsal D-ring (back) for fall arrest. 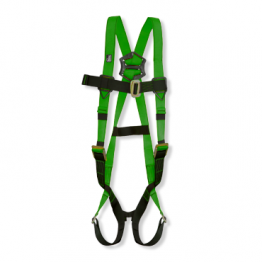 The 2 point H-harness is a two colored harness with 5 adjustment points, 1 dorsal D-ring (back) for fall arrest and 1 D-ring on the chest for ascending and descending. The high visibility H-harness is a two colored harness with 4 adjustment points.